I may have been a ‘classic’ girl in my youth when I was still searching for my personal style, but try as I may, I was not meant for it. It certainly did not suit my personality in the least. However, I do love classic pieces. The only way they work into my personal style, though, is to find ways of giving it an unexpected twist. Have you thought of layering pearls with a link necklace as I did here? I hadn’t either until I tried it a few weeks ago. And what do you know? I liked it. 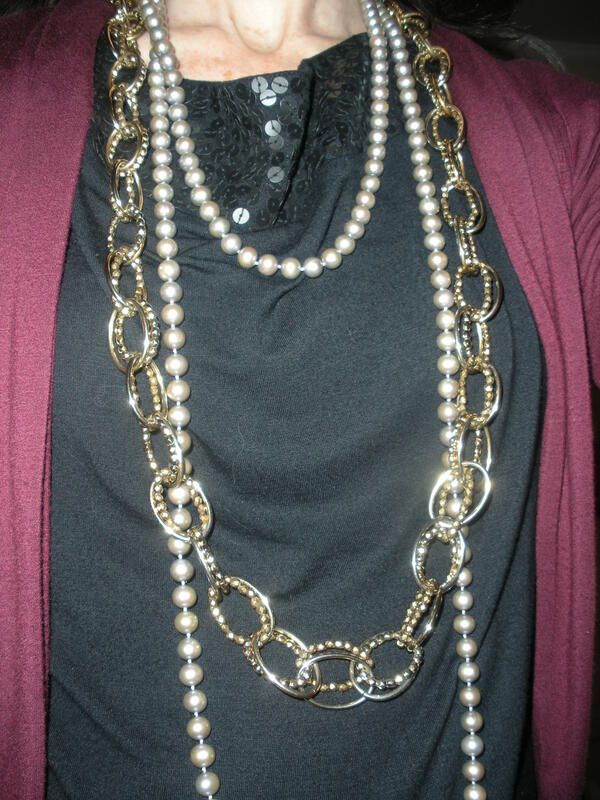 I was giving a presentation on accessorizing to a group of retired women the day I wore this, and I was told by an inside source that a number of ladies showed up at the next gathering layering their necklaces and trying things with their accessories they had not previously considered. I love that! The next time you reach for a classic piece in your wardrobe, try to think of a way to make it unexpected: pair it with something you normally would not, a trendier piece perhaps. Mix the color palette, as well. These pearls are gray, while the link necklace is gold. One might not normally think of blending a cool color (gray) with a warm one (gold). Since gray is not one of my best colors, when I wear it I always find a way to bring one or more of my colors into the palette so it is not so obvious. Both wine and gold (worn in the outfit above) are in my palette. Another way of approaching the classic mix is to purchase pieces that are classic in theory but have something in their design or details that give them an edge, removing some of its classic vibe. Consider what I created on Polyvore as an example: Little Black Dress with a Twist. The next time you buy a classic piece, find one that veres slightly away from classic. The dress I chose for this layout is not a traditional little black dress in its design, although a LBD is considered a wardrobe classic. Note that none of the companion pieces are totally classic either. Each has an element of classic to it, yet none would be considered a complete classic. I’m not saying classic dressing is boring, but if you are a classic guy or gal who is interested in inserting some umph into your style, first bring a few non-classic items into your wardrobe. Then start mixing them with your classics to see what happens. Your look and style might take a turn for the wilder side! Nice! I love the idea of mixing pearls with a link necklace, I seriously have never thought of that. Im going to wear that tomorrow!